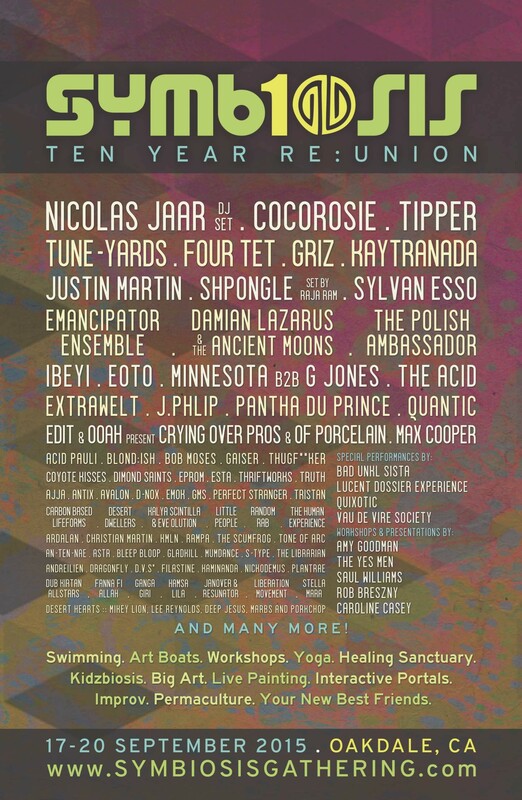 Spotlighting genres from techno to deep house, the Symbiosis Gathering returns to the Woodward Reservoir Regional Park (26 Mile Rd, Oakdale) this week for its ten year anniversary. From September 17 to 20 the festival will provide educational workshops on topics including indigenous seed stewardship, astrology, and permaculture gardening, in addition to an extensive lineup of electronic musicians. Several Oakland-based artists and organizers will be involved, and the festival will also feature art installations, art boats, yoga workshops, and live painting. Headliners include avant-garde pop sister duo CocoRosie, who just dropped their long anticipated album, Heartache City. Local variety show Tourettes Without Regrets will provide entertainment on day three of Symbiosis, and the Oakland-based Merrill Garbus and her band tUnE-yArDs will perform on the final evening. French-Cuban twins Ibeyi — notably one of the few acts featuring people of color — will bring Yoruba and English spirituals to the show. Check out CocoRosie's new album below. The Berkeley rapper celebrated the release of his fine new album with an emotional performance. The Wondaland crew led a protest in the Mission District and then performed a free concert at The Independent on Sunday.